Go for the comic book feel, the vibrant colours and the irreverent style. A horrible movie. I walked out half way through. 2nd movie in 36 years, I did that. Movie relies on cgi, way too much and moves way too quickly to be an origin movie. Amber Heard is a bad co-star, for Momoa. Also the music soundtrack was horrendous. Watch it, at your own discretion. Good, different original plot. Maybe be best superhero movie. Five stars. Best superhero movie I've seen in years. A definite recommend. Not sure where the bad reviews come from. I was surprised by comments that there was no plot or idea in the movie. It seems to be popular nowadays to say black when it is white and vice versa. It is probably because of reviewers like that the amazing movies like Valerian did not get much deserved audience. Anyway, if you have some brains you will get the idea from the movie plus some amazing visuals! A Poor script and bad acting.... not even the graphics could save this one. I was a total waste of a very long afternoon. Horrible movie, about 30 mins too long. The plot has too much irrelevant past-tense exposition. Jason Momoa did a decent job with the script he was given. The director seemed to rely on more CGI than a good script. I saw half a dozen people walk out, DC doesn't make great movies, other than Wonder Woman, which was a decent movie. It was a great move but would have been better it had explained why Aquamans mother never aged after being found and details on how she escaped being executed in the first place. Also with the cliffhanger at the end showing his brother being taken away. Taken away to where and what will happen to him and for how long? I sure hope in the next Aquaman movie he is not going to have to battle his bad brother again like Thors bad brother who keeps coming back to fight with Thor again and again. You really have to be a lover of marvel comics, superheroes, animation, fantasy, and adventure to be moved by the essence of this movie. I live for movies like this. I enjoyed the film, excellent origin story. Fast action. Would see again. The special effects were very good. However, some of the ocean creatures reminded me of a star wars movie. It is and age old plot of someone wanting something they don't deserve and willing to do evil to get it. Good movie. It has Jason Momoa!! I was delighted with all the actors in this film. William Dafoe? Nicole Kidman? Plus the story was great and so was the animation. Extremely well done. I’m going to see it a second time I liked it so much. Better than marvel movies in my opinion. This was the worst superhero movie I've ever seen. Terrible acting, terrible CGI. Terrible "funny" quips. It blows my mind people are giving this a great review. Save your money. If I could give it less than 1 star I absolutely would. Amazing special effects and, what is unusual for Hollywood, some sense and great old ideas that are rare in movies nowadays (for example: do what is right not what your country demands) It is really comparable to Valerian, which is another great movie. 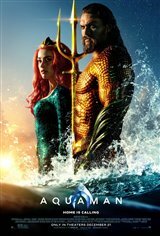 I use to read the comic book and all this was not any thing like it, but it did give some detail of his life story,the underwater part was great ,yes i would see it again and looking forward to see if there will be a part 2 to see how things turn out. Excellent movie!!! Highly recommend it. I saw it twice within two weeks, would see again. Terrific CGI!